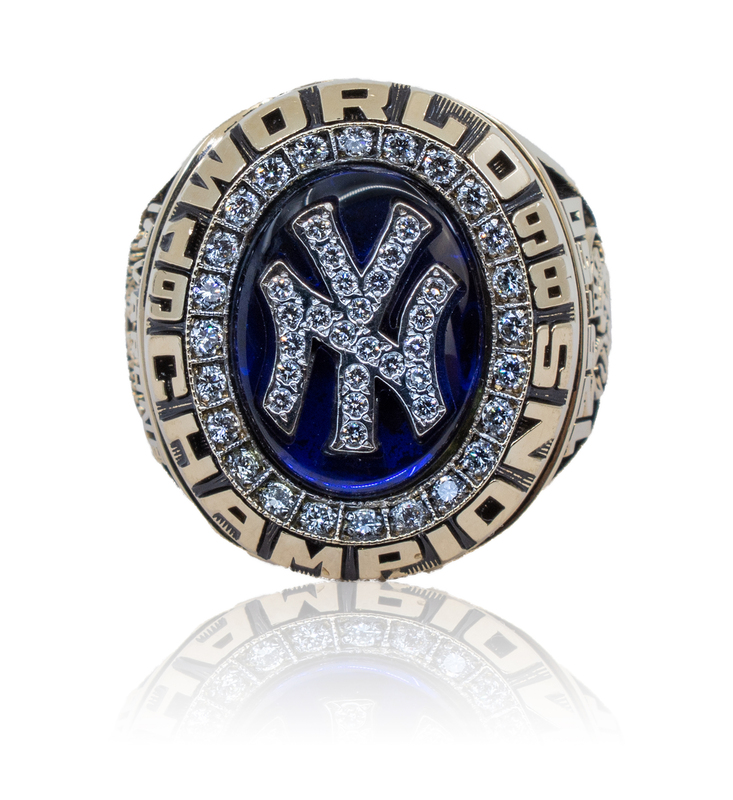 The 1998 baseball season found the New York Yankees in the midst of another dynasty in their storied franchise history. With a sweep over the San Diego Padres in the 1998 World Series, the Yankees won their first of what would be three straight titles (1998-2000) and four in five years (also winning the World Series in 1996). Under manager Joe Torre, the 1998 Yankees finished the regular season with a record of 114-48. The offense was led by Bernie Williams (.339 average), Tino Martinez (28 home runs, 123 RBIs) and Paul O’Neill (.317 average, 116 RBIs). David Cone led the pitching staff with 20 wins, while David Wells finished 18-4 and Mariano Rivera recorded 36 saves with a 1.91 ERA. 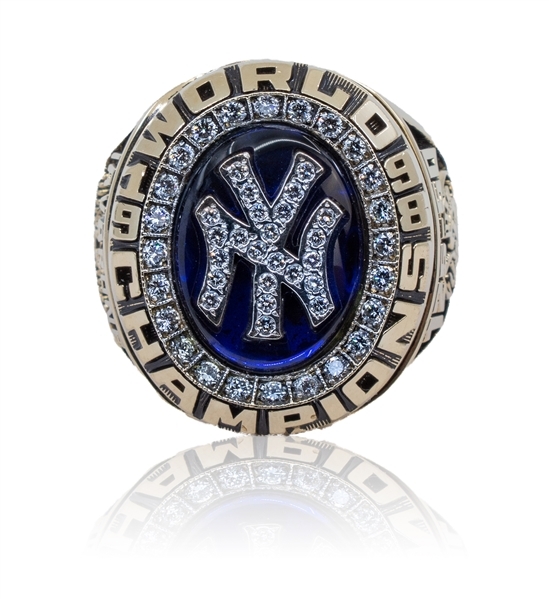 Offered here is a Balfour 10K gold 1998 World Series ring, which features 24 beautiful diamonds that make up the team’s famed NY logo, set on a navy blue stone background. Surrounding the logo around the bezel setting are another 24 diamonds. That particular number of diamonds is a representation of 1998 being the 24th World Series championship in franchise history. The outer perimeter of the ring reads “WORLD CHAMPIONS 1998” in relief work. 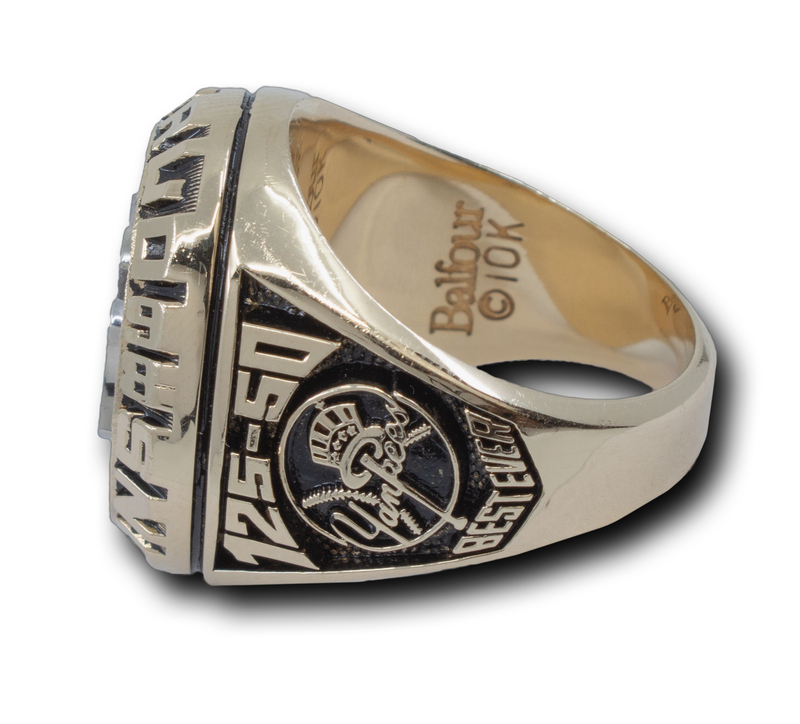 The right shank is centered by the Yankees team logo, with “125-50” above it and the words “BEST EVER” below the logo. This signifies the team’s overall win-loss record that season, including the playoffs, which resulted in a record for most wins in a single season. The opposite shank features the name “IAVARONE” at the top and the World Series trophy in the foreground of Yankee Stadium, with the word “TRADITION” at the bottom. The Balfour manufacturer and 10K marks appear on the inside of the band. 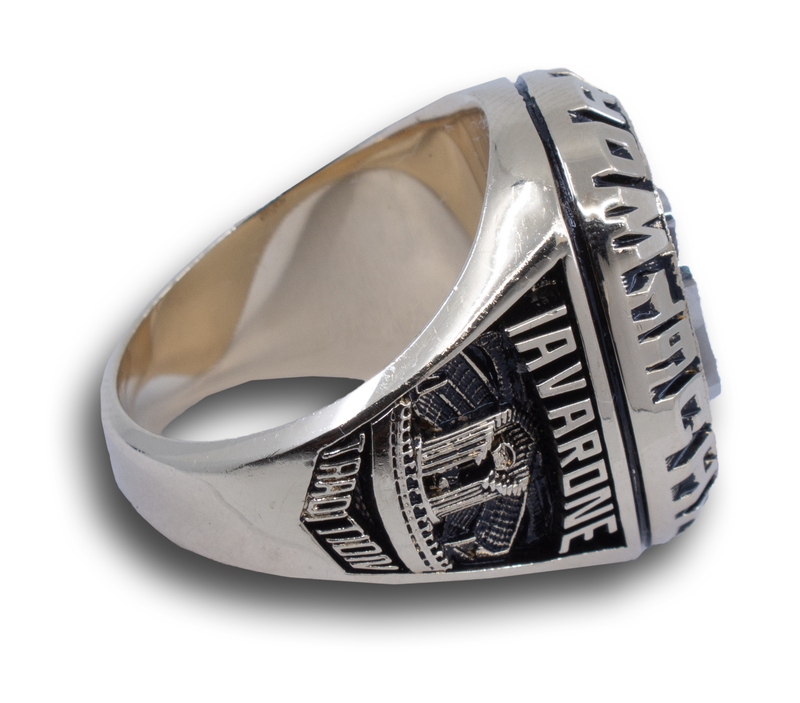 Ring size is an approximate size 10 ¾ and it weighs approximately 32.2 grams. 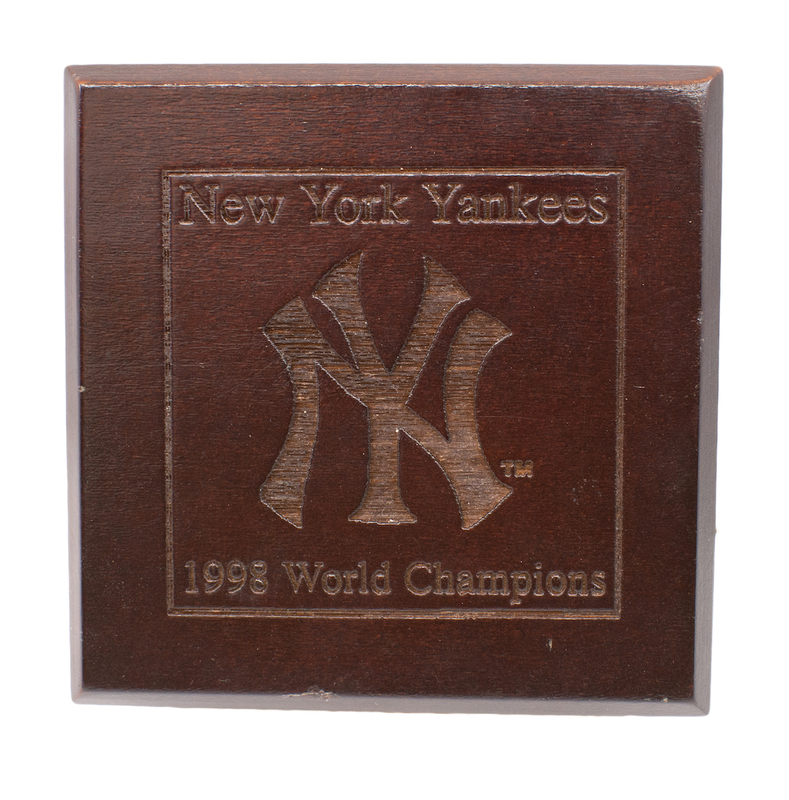 This item includes the original hinged wooden presentation box (measuring 3.5 x 3.5 and 2 inches high) which reads “New York Yankees 1998 World Champions” along with the team’s interlocking “NY” logo.